Nostalgia Reloaded – The outstanding Bengali food that​ will make you crave for more! When a Bengali gets invited to a Bengali food festival, what do you expect? Particularly if you are a Probasi Bengali (Bengali who lives outside Bengal), it becomes sheer nostalgia! I recently attended the Bengali food festival at The Leela by Aayheli! Aayheli is a Bengali Restaurant in the Hotel Peerless Inn, Kolkata. It is one of its kind restaurants when the city did not have any restaurant serving Bengali food. Later on, many Bengali restaurants mushroomed in the city but Aayheli remained little exclusive till today. They did a two-week long Bengali food festival at Jamavar, The Leela’s signature Indian Restaurant. I was served a refreshing Aam Porar Sarbot (aperitif of roasted mango pulp, flavoured with cumin) to start my dinner. Amuse-bouche at the table was Papad Bhaja (fried Papad) with Anarosh-er-chutney (Pineapple Chutney) and Tomato Khejur-er-Chutney (Tomato & Dates Chutney) the taste of the chutneys made me relived my childhood. Mochar Chop (Banana blossom croquette deep fried in mustard oil) distinct and delicious, Piyaz Poster Bora (Poppy seed & finely chopped onion, green chilli patty cooked on the griddle) this one is an all-time Bengali favourite. Chatakdari Jalpori (Bengali spiced deep fried prawns), perfectly juicy prawns cooked with salt, turmeric and mustard oil, absolutely delicious simplicity at its best. Last but not the least, the star starter was Rui Macher Patishpata (pancake stuffed with mashed Rohu fish and spices, finished with pure ghee), normally Patishapta is a popular Bengali dessert item, Patishpata has fillings of coconut and jaggery and rolled inside the Crep. Here the Chef experimented tweak it with the fish and made it a savoury item. Then came my grand thali, I had Sonali Moong Dal (green Grams cooked in traditional Bengali style), this dal is a simple everyday dal, mostly cooked in all Bengali homes. Piyaj Aloo Posto (cubes of onion and potato cooked with ground poppy seeds), all Bengalis are obsessed with this dish, you give posto to a Bengali any time a day or a year he/she will be very happy. Chamoki Chingri Malai Curry (Fresh river prawn cooked in coconut cream- a Bengali speciality) this dish is a milder form of Chingri Malai Curry, very subtle, mild flavours and succulent prawns. Kancha Lanka Diye Murgi (Chicken cooked with onion and green chilli) this also was a very milder version of a Bengali regular chicken curry the flavour of green chilli really came through. Morich Mangsho (Mutton cooked with whole and crushed pepper) this was a total variation from the popular Kosha Mongsho or Mangshor Jhol which Bengalis have. The flavour of the black pepper was overpowering. No Bengali meal is complete without the delectable variety of Mistis (sweet meals). This meal was no exception, I was served with a dessert platter comprising of Paramanno (traditional rice kheer) perfectly cooked Gobindo Bhog rice (Bengali aromatic rice) in reduced milk was perfect in texture and flavour. The ever-popular rossogulla Gur er Rajbhog (cottage cheese dumplings simmered in thin sugar syrup with dates jaggery) the flavour of Nolen Gur (Date Palm Jaggery) shine through this dish. The Bengalis favourite Sandesh (sampler of whey cheesecake) was absolutely melted in the mouth, soft textured. These mistis were a perfect ending to a beautiful meal. Previous Post Wonderful Mountain Foodie Experience in the Valley of Nepal that will Blow Your Mind! Next Post Healthy Blushing Glory Smoothie In Jar For Your Loved Ones! 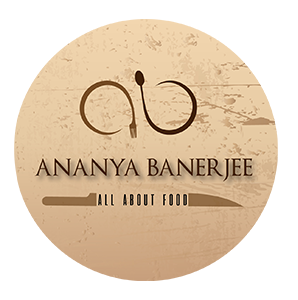 Join the Culinary Expert and Cook Book Author Chef Ananya Banerjee in her exciting quest for food and travel experiences.